It was the Halloween special on Strictly Come Dancing this week so lycra and sequins were out and blood and black eye-shadow were in for a Saturday night “spooktacular. We are into week 6 and we are down to eleven celebs. It still looks like the girls are dominating – the boys are doing well to get someone in the top three on the judges leaderboard. 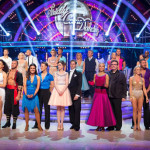 Natalie Gumede maintained her high level of recent performance to top the leaderboard with a 38 for her Viennese Waltz. Patrick got the boys into joint second place on the leaderboard along with Abbey and Susanna. At the bottom it was Dave and Mark. Patrick Robinson and Anya Garnis opened the show Quickstepping to ‘Man With the Hex’ by Atomic Fireballs. Patrick was still wearing the plaster cast from last week but he looked good when dancing in hold so apart from a hurting right hand and a dodgy knee he was back to top form. It was a lively opening dance and should keep Patrick well away from the dance-off. Len: I was bewitched, bothered and bewildered. The energy and speed was impressive. Bruno: The magic spell you concocted had all the right ingredients. It was very good. Because of the body contact your body is a little loose so watch that. Craig: The energy was phenomenal. It was full of character and your timing as always was good. Darcey: The choreography was great and the footwork was fast. A score of 34 is Patrick’s best of the series. Fiona Fullerton and Anton Du Beke danced the Charleston to Al Donahue’s ‘Jeepers Creepers’. Fiona looks like she is gradually growing in confidence. It was a visually interesting Charleston routine although Fiona looked a little flatfooted with very little bounce. Bruno: That was like Halloween at Doris Day’s house. There wasn’t a lot of crazy energy and you need to watch the timing. Craig: The whole dance was too nice and quiet. On the good side you do have a fantastic amount of swivel. Darcey: I loved how clean and placed you were. The boys are right though you were out of time. Len: I don’t agree with these people. I thought it was a proper Charleston. Well done. A score of 28 could put Fiona towards the bottom half of the judges leaderboard. Ben Cohen and Kristina Rihanoff danced the Paso Doble to Muse’s ‘Supermassive Black Hole’. For some reason Ben decided to start the routine without his shirt on, presumably as it was very hot in the studio. The women in the audience didn’t seem to mind that much. I wondered whether Ben was auditioning for the Chippendales. Craig: I was slightly distracted and din’t look too much at the footwork. It had power and machismo. It was a little bit blocky but the choreography was great. Darcey: If you are going to show off your chest and waist you have to use it. You gave me a great lasting image so thank you. Len: Looking at you we have so much in common. It was an explosion. Exuberant attack. It could have had a bit more finesse but the attack was great. Bruno: Your presence and power were incredible but you do have to shape it a bit more. Let me show you ( Bruno throws himself into Ben’s arms at this point). A score of 32 is Ben’s best of the series. Sophie Ellis-Bextor and Brendan Cole performed Jive to ‘Maneater’ by Hall and Oates. Sophie had one of her weaker dances last week with her Cha Cha Cha so she had something to prove this week. It was a very different Jive and it was wasn’t totally convincing from Sophie who looked a little hesitant. 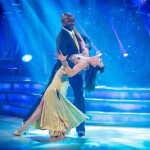 Darcey: The Jive is a fast high energy dance with bounce and sharp kicks. Your legs were always bent and didn’t get into any sharp kicks. Len: You are a very competent dancer. You need to come out with more impact. Get out there and attack it. Bruno: You become a bit leggy. You have a wonderful sense of style and great performance value. Your kicks and flicks have to be sharp. A score of 28 will be a bit disappointing for Sophie and means she needs viewer votes this week to be sure of staying out of the bottom two. Natalie Gumede and Artem Chigvintsev danced the Viennese Waltz to Natalie Duncan’s ‘Devil In Me’. I loved the mist effect at the start of the dance and it was another polished performance from Natalie. Great outfits as well. This could score very well and it earned a standing ovation. Len: It was lovely and you are a great dancer. However the challenge in this dance is to stay in hold. Artem you have to push her harder. Bruno: The lady of the lake emerges from the mist. This was magic. Craig: You make me sick…you are Fab-u-lous. Darcey: I expect so much from you and you never disappoint. A 38 including the first two 10’s of the season should see Natalie safely through to next week at the top of the leaderboard. 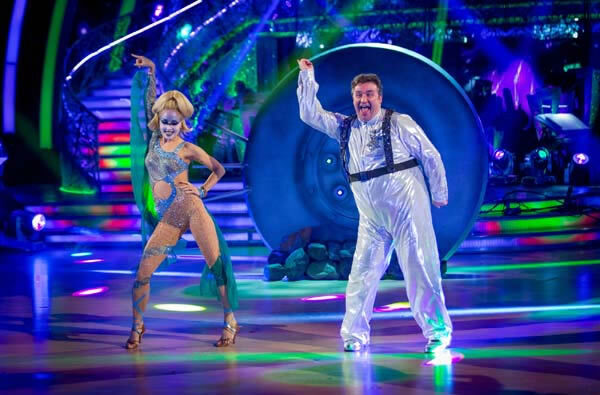 Mark Benton and Iveta Lukosiute danced the Paso Doble to Sarah Brightman’s ‘I Lost My Heart to a Starship Trooper’. Mark started off on a flying wire as he landed in his spacesuit. He has good rhythm and sells each dance very well and he dances with a smile. Ben: Fun but not quite the right content for a Paso. Craig: A bit stompy and basic on the paso element but your rhythm was good. Darcey: The entertainment and the attack were there but the shaping needs work. Len: It was long on performance and short on technique. A score of 25 puts Mark in dance-off territory and at the bottom of the judges leaderboard so far tonight. He needs viewer votes. Rachel Riley and Pasha Kovalev danced the American Smooth to ‘I Put a Spell on You’ by Screamin’ Jay Hawkins. After a couple of dodgy dances in previous weeks this dance seemed to suit Rachel a little more. It may be that there was more leading from Pasha but Rachel can look forward to a better score than her 22 last week. Craig: Welcome back to the competition. Darcey: What a difference from last week. Bruno: The Zombie bride has found her mojo. A score of 30 is Rachel’s best of the series and takes a bit of pressure off her. She clearly performs better in ballroom than latin. 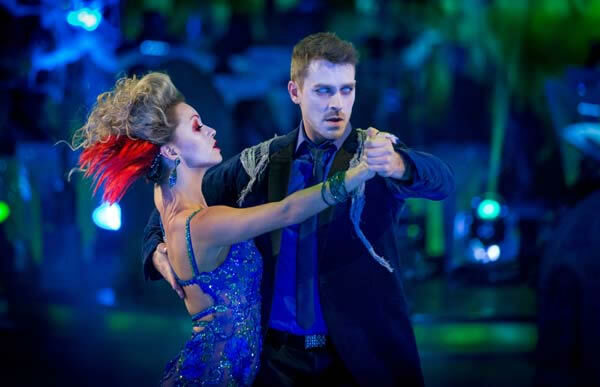 Ashley Taylor-Dawson and Ola Jordan danced the Tango to Ne-Yo’s ‘Beautiful Monster’. The dance had a lot of presence and drama and should put Ashley in the top half of the scoring. Darcey: I’m attracted to the evil Ashley. Good staccato models. Len: If you want to shine you have to polish. Crisper feet. Polish it up. Bruno: You played it so well. Now you have to polish the technique. There are slight faults. Craig: Aggressive, dark, mysterious I really loved it. A score of 33 is Ashley’s best score so far. Abbey Clancy and Aljax Skorjanec danced the Rumba to ‘Stay’ by Shakespeare’s Sister. It was another standing ovation for Abbey with a very impressive Rumba. Len: For someone with no dance training you are amazing. Bruno: You’ve got me and you are here to stay. Darcey: Just watch the transitions between each move but the chemistry is brilliant. A score of 34 puts Abbey level with Patrick and joint second on the leaderboard so far. 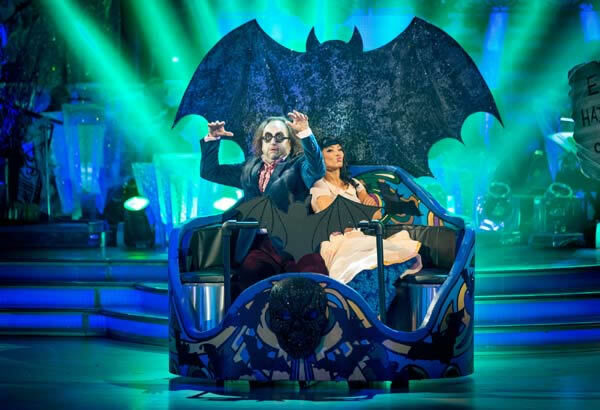 Dave Myers and Karen Hauer danced the Jive to Bobby Boris Picket’s ‘Monster Mash’. The pressure is on Dave as he is firmly welded to the bottom of the leaderboard so he knows that he needs to get strong viewer support. Will this be the week his luck runs out. His level of dancing is so far behind that of the rest of the remaining celebs. Darcey: It was a soft shoe shuffle in mashed potato. It was funny but the Jive was non existent. Craig: A little bit dismal like the weather. Darcey: The thing I don’t need from a Jive is flat feet. Craig: You’ve excelled yourself. It was like a a cumberland sausage chasing the mustard. Dave Myer the trier. 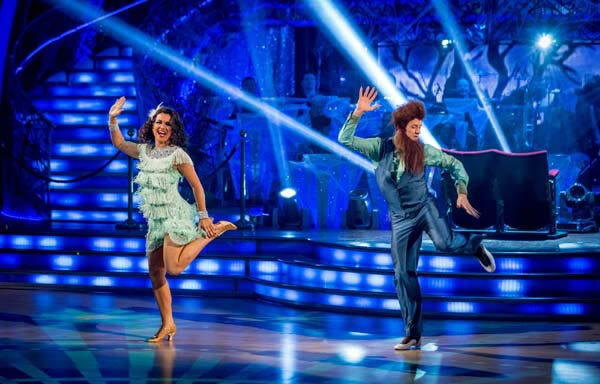 Susanna Reid and Kevin Clifton closed the show with a Charleston to Creedance Clearwater Revival’s ‘Bad Moon Rising’. We love Susanna but someone should put her in more flattering outfits. Her Charleston seemed very bright and confident. Craig: You take full advantage of the freedom of this dance. You used your face well. Darcey: It was sweet and cheeky and you hot nice position on those lifts. You are doing the right job. Len: Good technique, plenty of treats. Bruno: You give so much joy to everything you do. The sidekicks were absolutely wonderful. A score of 34 gives Susanna joint second place on the judges leaderboard with Abbey and Patrick. We have Natalie at the top with Dave and Mark in the bottom two. Who will leave the show this week? We will find out on Sunday night.